A MAN has asked for his 72-hour marriage to be annulled because he was pressured into it by his parents. The husband, 27, claimed he had to follow his parents wishes and they told him their health would suffer if he did not. He told the Family Court he “succumbed to pressure from his parents to obtain permanent residency in Australia and because his religious and cultural obligations obliged him to do what his parents wanted”. The man claimed he was married under duress and the psychological manipulation of his family. The court heard he met his wife while studying in Australia on a student visa in 2007. He applied for permanent residency but was rejected in 2009. The couple broke up and he returned to Indonesia for a few months, during which time the girlfriend travelled there and they reunited. The court heard an appeal to the Migration Review Tribunal failed and he was told unless he applied for a partner visa he would have to stay in Indonesia. In January 2011 he was granted a prospective marriage visa and travelled to Sydney, where he married the Australian woman in March 2011. The court heard the couple separated three days later and the husband went home when his visa expired last October. 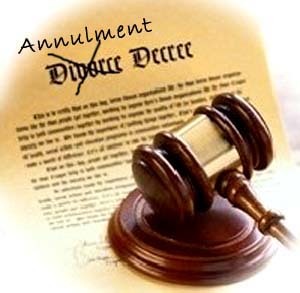 The wife agreed to the annulment, but Justice Judith Rees said the woman’s consent was not enough. Justice Rees rejected the husband’s application, saying a nullity could not be issued lightly and there was no admissible evidence of the level or type of pressure exerted on the husband by his parents.